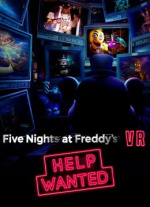 In another curve ball during State of Play, Five Nights at Freddy's VR: Help Wanted has been announced for PlayStation VR. Coming in the spring, this new chapter in the popular horror series ups the ante by placing you in a virtual version of the intense, jump scare heavy action. If you're unfamiliar with Five Nights at Freddy's, it's a series that caught on in a big way on PC over the last few years, becoming massively popular to watch on YouTube. You're working the night shift as a security guard at a Chuck E Cheese style family restaurant, complete with creepy animatronics. These mechanical horrors make their way towards your work station, and you have to keep an eye on them all by checking cameras and flicking light switches. This version of the game will feature levels from previous games and will also include some brand new scenarios. If you like a good scare or two, this could be worth a look. Will you be playing Five Nights at Freddy's VR: Help Wanted? Look behind you in the comments below. I've always wanted to see what the fuss was about with Five Night At Freddys but if this is just a load of Jump scares then I doubt id be able to play this.I'd probably have an accident or a heart attack whichever came first. I really dislike horror games in VR. It's too much. Sorry freddy but I'm gonna have to give you the finger. @themcnoisy I'm the opposite. Horror in VR is the only place I seem to enjoy it now. I want more Resident Evil games in VR. @SoulChimera I'm a big fairy tbh. I had nightmares for weeks over Blair Witch Project lol.